A mosque is a place of worship for followers of the Islamic faith. Muslims often refer to the mosque by its Arabic name, masjid. The primary purpose of the mosque is to serve as a place where Muslims can come together for prayer. The Kul Sharif mosque in Kazan is the main mosque of the Republic of Tatarstan, one of the largest Muslim places of worship in Europe, it is located on the territory of the Kazan Kremlin. This beautiful architectural complex was built in place of the legendary mosque of the Kazan Khanate, which was destroyed during the assault of Kazan by troops of Ivan the Terrible in 1552. The mosque carried the name of its last Imam Seid Kul Sharif - one of Kazan defence leaders. It is believed that the mosque had two stories and eight minarets (more than any other Mosque in the world), oriented towards the 8 parts of the world. When Ivan the Terrible captured the city the mosque was burnt down and ruined as well as other Muslim buildings of the Kazan Kremlin. The reconstruction of the Kul Sharif Mosque began in 1996 and ended only in 2005, just in time for the 1000th anniversary of Kazan. The Kul Sharif Mosque is not a single building. It is a really complex that consists of three parts: a mosque, a memorial stone and an administrative building. The entire complex occupies an area of almost 19 thousand square meters. The mosque can accommodate 1,500 people and the area in front of it – 10 thousand people more. The mosque complex includes the building of the mosque, a museum of the history of spreading Islam in the territory of the Middle Volga, a room for the grand wedding ceremony (nikah) and the imam's office. The building of the Kul Sharif mosque in a plan is 2 intersected at an angle of 45-degree squares in a well-known mark in the Muslim world which means the blessing of Allah. The walls are the eight overlapping lancet arches, carved in marble framed verses from the Quran and dome is cut by windows in the shape of tulips. The Kul Sharif mosque is in the UNESCO World Heritage List. 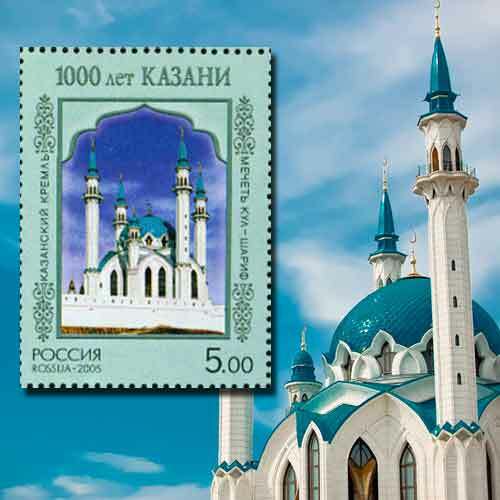 In 2005 Russia Post issued postage stamp depicting this beautiful mosque.